Please note: The information about the Davison ancestors has been retrieved from records on FamilySearch.org, which I have not personally verified, therefore assumptions have been made. 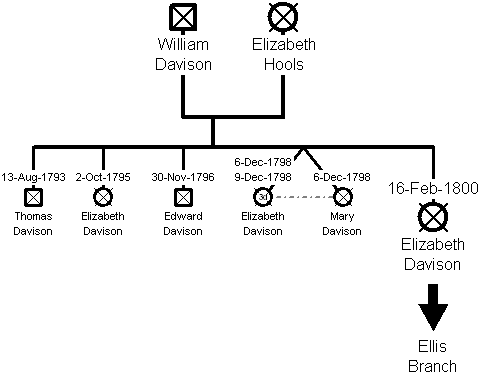 The earliest known Davison ancestor is William Davison and his wife Elizabeth Hools. They had six children all baptised in Hawarden, Flint, Wales. The youngest, Elizabeth Davison was baptised on 16 February 1800. In 1841, Elizabeth is staying with the youngest daughter and family. It is assumed that William died before 1841. Elizabeth Davison was baptised on 16 February 1800 in Hawarden, Flint. She married Thomas Ellis also from Hawarden. They had seven children. In 1841 they were living in Wood Lane, Ewloe Town, Hawarden. Thomas was a collier and in 1851 he was a coal miner and farmer of 8 acres.